In the male-dominated meat industry, an all-female conference helps tip the scales. The Women Working in the Meat Business conference (this October 2†“4 in Orange County, NC) has nearly tripled its enrollment since 2013. The first North Carolina gathering consisted of only 25 women, all but one hailing from the Southeast. 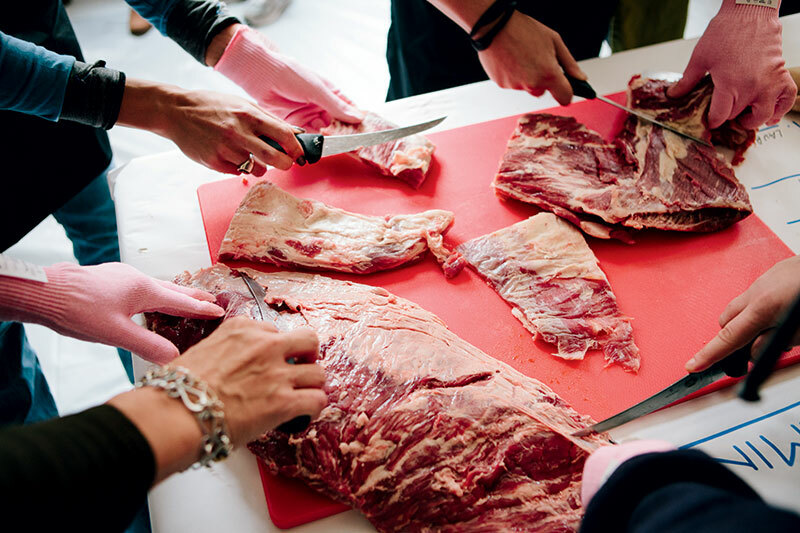 This October, 70 ladies from across the country (and Canada) will descend on the Tar Heel State for a curriculum that’s broadened beyond butchering to include topics like farm management, pricing, and the marketing of uncommon cuts. “This is such a male-dominated industry,” says Elizabeth Karmel, former chef at New York City’s Hill Country Barbecue Market and current proprietor of carolinacuetogo.com, a purveyor of whole-hog barbecue by the pound. “The idea of bringing together a group of women in this field is very progressive.” She’ll be leading a demo on preparing underrated cuts of lamb and mutton at Cane Creek Farm, a pig operation in Saxapahaw, North Carolina, owned by a former attendee. And the event’s poised to continue its upward trajectory: “We currently have more applicants than our space permits,” says Sarah Blacklin, program director of NC Choices, the sustainable- farming organization that hosts the conference. “Women are increasingly the new face leading the pasture-raised meat movement, and they’re working in all areas of the supply chain.” Learning alongside others in the same profession, Blacklin adds, creates a lasting network and lifelong friendships. “The majority of our graduates stay in touch and even conduct business with one another.” Attagirls.